For the first time, the loved ones of a Houston couple shot and killed in a botched police raid have returned to the Harding Street home. 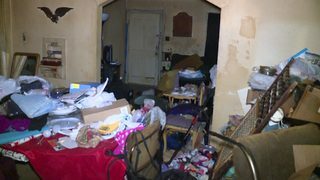 Channel 2 Investigates was granted access inside the house with the family. Four HPD officers were shot and homeowners Dennis Tuttle and his wife Rhogena Nicholas were killed at the house at 7815 Harding St. on Jan. 28. The decades-old home is tiny by modern standards and very cramped due to personal belongings stacked high off the ground. Channel 2 Investigates was granted restricted access but our cameras captured multiple bullet holes as well a house that was in a chaotic state due to the couple’s belongings as well as the scene that played out at their home. Tuttle could not believe the various bullet holes inside the kitchen, including in an upper cabinet and the height at which they made impact. “Look at that -- a man 5 feet, 6 inches (tall) -- what are they shooting at? He’s not on a chair, he’s standing. He’s probably about this tall. Who are they shooting at and why?” Tuttle said. John Nicholas, Rhogena’s brother, was also at the home. “I didn’t sleep last night, trying to figure out what, what I was going to see,” Nicholas said. While standing in the front yard of his sister’s home, Nicholas talked about what stood out for him after he toured the inside. “I really didn’t expect to see as many bullet holes and stuff like that and some of the stuff that was destroyed,” Nicholas said. For family members, the tour was polarizing considering the events have escalated into investigations by the FBI, the District Attorney’s Office and Houston Police Department. Tuttle said he has not heard of an apology from HPD Chief Art Acevedo. He is hoping for one in the near future. Tuttle says Dennis Tuttle's great-grandfather was once an HPD police officer.